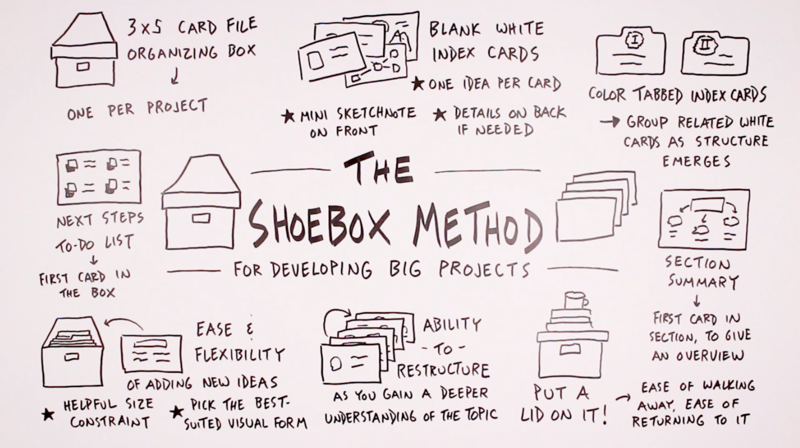 If you are looking for an analog approach to capturing and organizing your ideas around a big project, then I have a technique that you might be interested in, one that I’m calling The Shoebox Method. I am currently using this method for one of my big projects, a resource called Build an Online Course with Sketchnotes, and I thought I’d describe for you the details of what this method is all about. 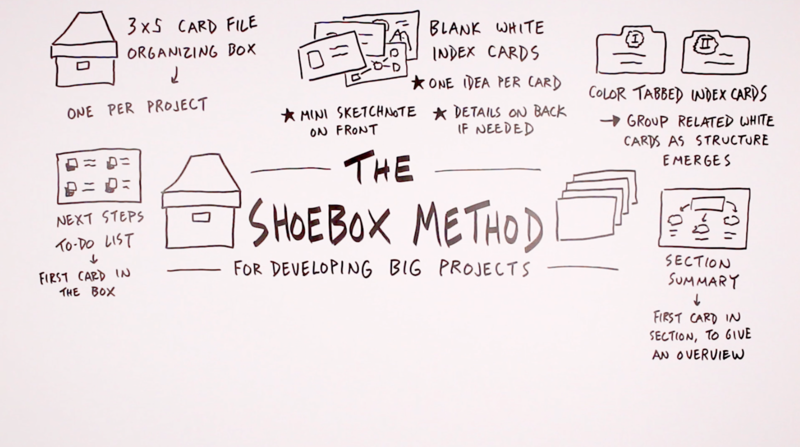 The primary container for this method is a box that holds 3×5 index cards, and the idea here is that you can use one of these boxes for each big project that you’re working on. 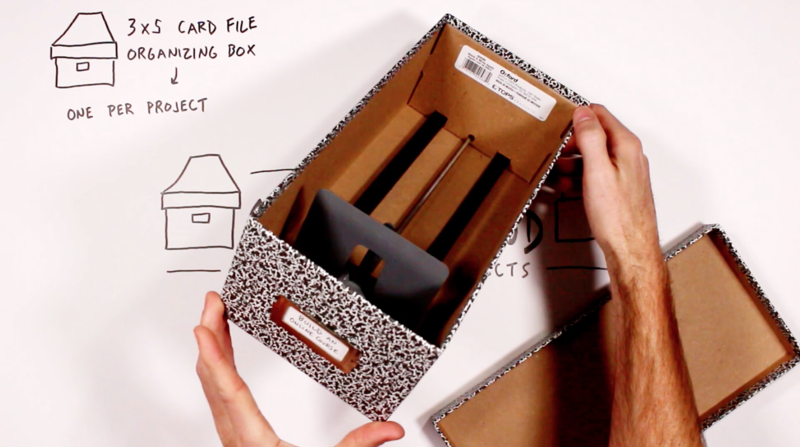 This index card organizer provides a single place to store all of your project ideas. I’ve labeled my with the title “Build an Online Course” because that’s the resource I’m working on. One helpful feature of this box is that it’s got a slider built into it to keep your index cards upright. As you fill the box with more ideas and more cards, you can keep moving that slider back. So that box is the container for ideas, but the next question is: What do you put inside it? To start, I’ve been using just blank white index cards to capture the individual ideas that I want to include within the course that I’m building. Blank white index cards provide just enough space to capture a single idea with a quick sketch and a few words. It’s on those blank cards that you can capture the ideas that come to you as you’re working on your project. What I like about index cards is that they’re the perfect size for this purpose: there’s enough space to include one idea per card. I’ve been including a mini sketchnote on the front of the card (something like an icon, scene, or diagram with supporting text) and then if I need to I can add more details on the back of that card. It’s nothing fancy or polished, just some visual cues and a little bit of text to remind me of the details. There’s a second style of index card that I’m using in conjunction with those blank white cards, and those are color tabbed index cards that I’m using to group related white cards as structure emerges in the project that I’m working on. 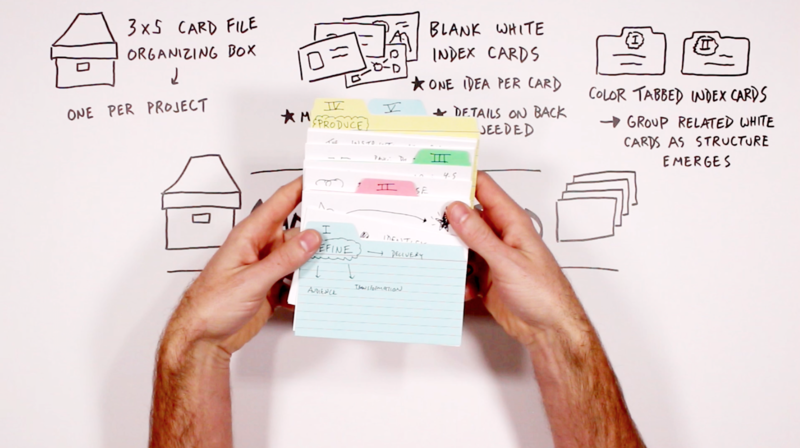 Color index cards with tabs help you to organize your ideas once a big-picture structure starts to emerge. 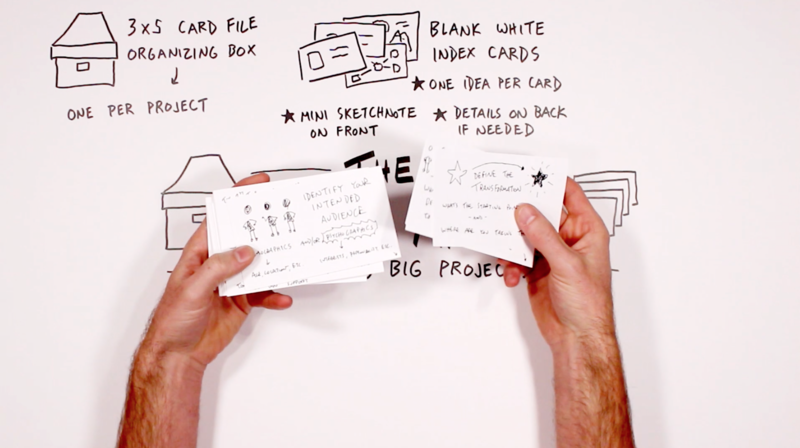 So at first you’ll gather a bunch of ideas on those white index cards, but once you start to see how you might group those ideas and give some structure to your project, that’s where these color index cards come in handy. In my case, since I’m developing an educational resource I’ve been using this second category of card to identify each unit within the course that I’m building. 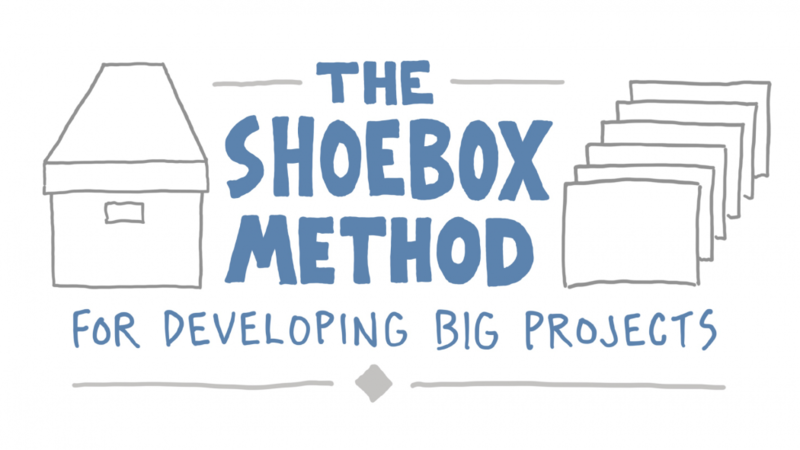 So once you’ve identified the structure of the project you’re working on, you can add that structure to your shoebox, which gives you a place to put each new idea that you add to it, depending on where it fits within that structure. In addition to those two main categories of cards, there are a few other specific ones that I’ve been using to help me move my project along. The first is a single index card that I add to the front of the box that includes next steps, a to-do list to remind me what I might want to tackle next for this project. Add a single index card at the front of the box to keep a to-do list of next steps. That’s been a helpful way to maintain momentum on a day-to-day basis, each time that I grab this box off the shelf and get to work. In this case I’m processing the first iteration of the course I’m building, which I delivered live in an online workshop format. So in the image above you see me keeping track of which of those workshop lessons I’ve already added to my shoebox, and what’s the next one to tackle. As your project grows and you add more details and more sections, I think that it might be helpful to include a single card at the beginning of each section that summarizes what that section is all about. With a section summary after each color card, you can quickly remind yourself what that section is all about. That single-card overview can help you to jump back into that section and remind yourself what’s included within it. Right now I’m using the tabbed cards themselves to capture some of those details, but once those sections feel more or less full I’ll be creating a section summary like what I just described. 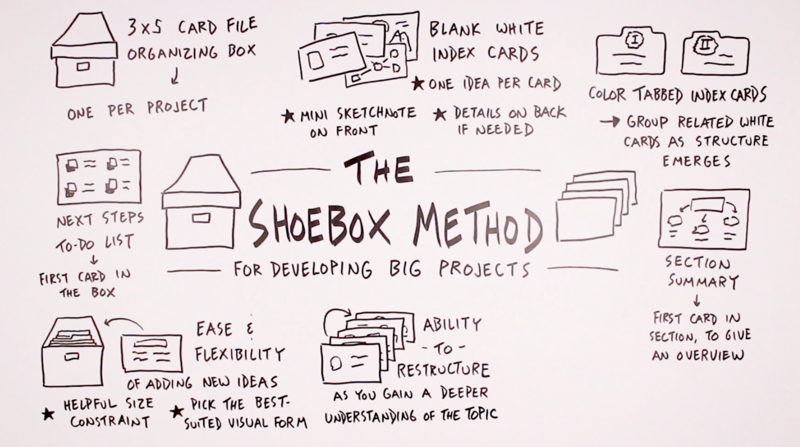 So with that as the general overview of the Shoebox Method, let me next describe some of the benefits – why I find this particular method to be useful. First of all, we’ve got the ease and flexibility of adding new ideas to your project. 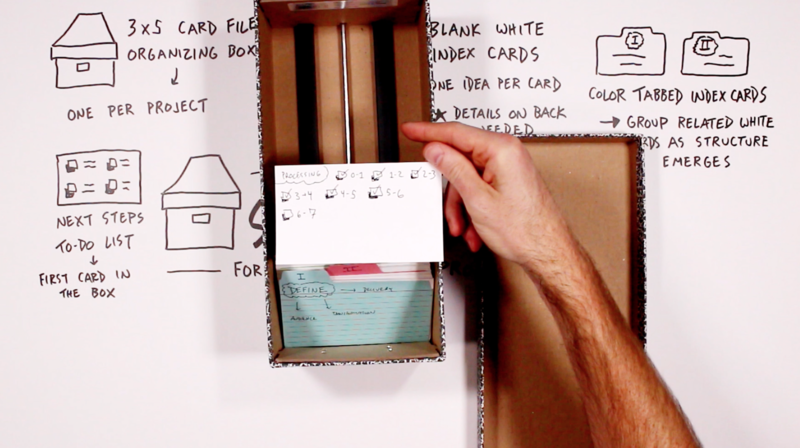 The use of index cards makes it easy to add ideas in the form that most useful. For me, the 3×5 index cards are a really helpful size constraint. You have enough space to get your idea down, but not so much that you get lost in the details. 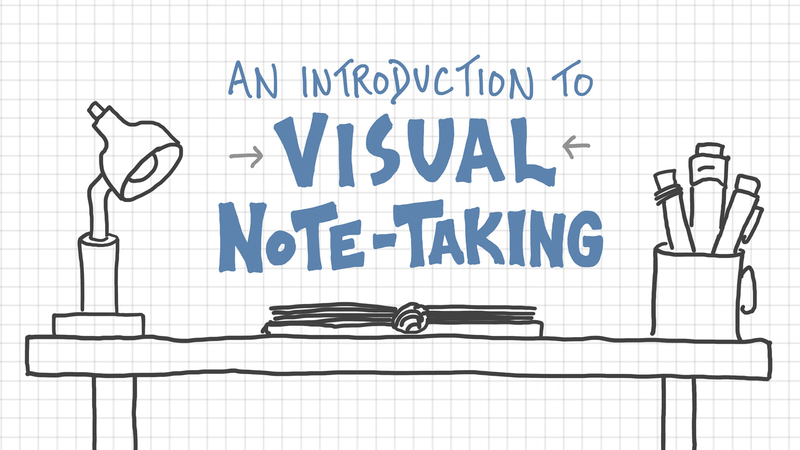 And with each blank card you have the ability to pick the best-suited visual form of the idea, which is where your sketchnoting skills come into play. You get to decide whether the idea that you’re capturing can be best represented with a scene or a diagram or even just a single powerful phrase. And because of the small size and low price of index cards, if you’re not happy with your first attempt at capturing that idea, you can throw it in the recycling bin and just grab another. The second primary benefit of this method is that you have the ability to restructure the ideas of your project as you gain a deeper understanding of the topic at its core. As the project grows and you gain more understanding of the topic, you can easily reorganize your ideas to match your current understanding. Often it’s not until you dig into the nuanced details of a project that you really understand what’s going on from a big-picture perspective, and with this method you can go back and forth between the details and the big picture. As you continue adding new details you might realize that your first structure isn’t quite right, and with this method you have the ability to reorganize those detailed cards and bring in some new section headers with the color cards that better represent the structure that you actually see. And for me, the final benefit of this method is that at the end of a work session I can literally put a lid on the box, put it back on my shelf, maybe even stack some books on top of it, and be done with it for the day. Put a lid on the box, put it on the shelf, and know that it’ll be there when you’re ready to return to it. It’s that ease of walking away from the project (and the ease of returning to it) that appeals to me. Though there are digital tools that allow you to do similar things as what I’ve described here on your phone or tablet or computer, I much prefer to work in an analog way: using pen and paper, making physical marks on cards, and moving those cards around. That is a more helpful extension of my brain and what I’m thinking about than working on a screen. 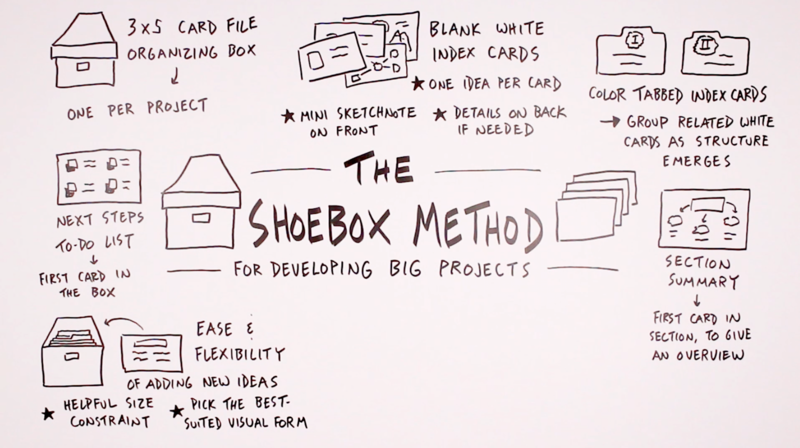 If you are working on your own big project and these ideas sound appealing to you, then give this Shoebox Method a try. Maybe you’ve got a course that you’re building, a book that you’re writing, or a presentation that you’ll soon be giving. See if this analog and modular way of working with those ideas is a helpful way for you to manage both the details and the big picture of whatever it is you’re working on. You can also view our full course library here. Good luck making progress on whatever project you’re currently engaged in!